Now available in 2 widths, 130mm and 142mm to provide the perfect fit for more riders, regular and large. 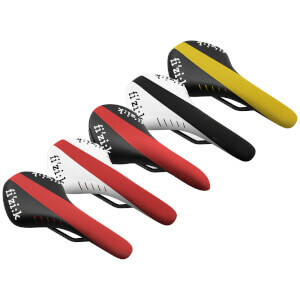 Use the Spine Concept Evo system to find your perfect fit. Arione R3 is for The Snake: Flexible Spine. If you are very spinally flexible (far less than 90 degrees between your straight legs and your back when bending over as far as you can, keeping your legs straight a shoulders’ width apart), you are a Snake. You achieve the performance position using your spinal flexibility alone, not rotating your pelvis at all. You will like the flat, narrow and long shape of the Arione.